Born in 1945 in Libourne (France) Georges Friedenkraft received his education in Paris. He obtained Doctorate degrees in both Science (Biology) and Arts (Philosophy). He is presently Research Director at the CNRS (the French National Center for Scientific Research) and gives lectures in several universities. Married to Malaysian artist and journalist Goh Wan Hua, he is father of four children. He has contributed to poetry anthologies and reviews from many parts of the world and received several awards and prizes in poetry. 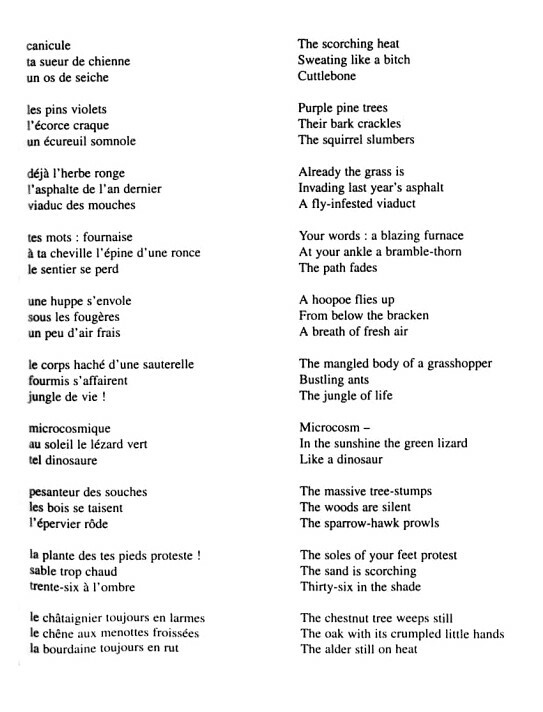 Credits: Anthologie du HAIKU en France, sous la direction de Jean Antonini, Aleas, France, 2003. Revised Thursday, 14-Feb-2002 11:41:41 EST. Copyright (C) 2001 World Haiku Association.